All transactions are safe and secure with a reliable history in online purchasing behind each of our associates. Buy the Seinfeld A Shirt About Nothing t-shirt to own Seinfeld clothing and merchandise. The front of this Seinfeld tee features many popular quotes from the TV show, including the George Costanza Seinfeld quote, "The jerk store called. They're running out of you!" The memorable quote can be heard in the episode "The Comeback" from the eighth season. In that particular Seinfeld episode, George suffers from l'esprit de l'escalier (stairway wit), which is a phrase used to describe a riposte to an insult, or any witty, clever remark that comes to mind too late to be useful - when one is on the "staircase" leaving the scene. 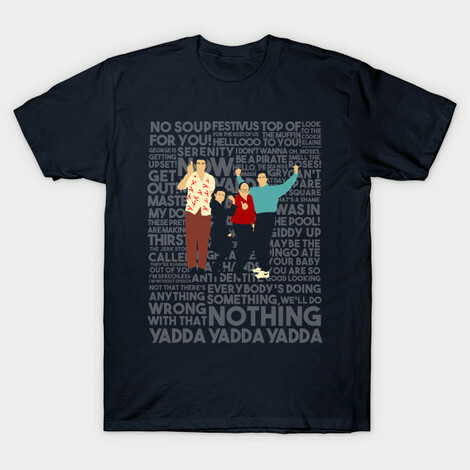 In addition to the Seinfeld A Shirt About Nothing tee above, browse the Seinfeld Clothing Gallery for more apparel like men's and women's clothes, kids shirts or hoodies.